This busy Northern Suburbs Post Office is situated amongst new housing estates with a growing population. There is a Friendly Village type atmosphere with other major retailers such as Woolworths, Chemist Warehouse, Medical centre and other specialty retailers. The business is showing considerable growth due to the addition EIS services and Passports late last year. The Post Offices now has all services including Passports and working with children interviews as well as a comprehensive range of ID Checks state. The shop is well presented and there is a separate sorting room with 327 boxes installed and plenty of storage for parcels. This business is ideal for a couple or a single operator with part time assistance who is looking for a high growth Post Office. The Rochester LPO is a superb country business in a very strong town. This business represents a solid income with A good cash flow. It is the only Post Office in the area doing I.D. check, passports, EIS transactions. The rear of the post office could be renovated to provide residential accommodation (at least 3 Bedrooms). Rochester is located 2 ½ hours from Melbourne and is approximately 27klm from Echuca and 61klm from Bendigo. The population of the town is around 3200 with more people in the surrounding areas. Rochester is the home of new famous painted silos. Top Notch Tier 1 Post Office with current shop fit. Performs all services including Passports, ID Checks and Working with Children. This business shows consistent growth with current Commission of $335,000 P.A. A couple or partnershop would ideally suit this business. This modern is fitted out to Australia Post requirements and is situated in busy inner city shopping strip supported by major retailers including Coles All normal Post Offices services are performed here including Passports working with children and comprehensive range of ID Checks, EIS services etc etc. There are 312 boxes installed with 24 hour access. Long lease, there is plenty of parking and the business is easily run by a couple. BRAND NEW TATTS SHOP FIT IN PLACE - LOOK NO FURTHER - the formula of success is right here in the Golden Triangle of Wedderburn. This Trifecta business offers a unique lifestyle for the new owners wanting a peaceful, steady pace and a strong commumity lifestyle. For 15 years, the current owners have built and expanded their business churning a healthy profit of $200K + per annum. Now wanting to pass on A PROVEN FORMULA to repeat the next successful story of ownership. This business boasts 3 monopoly income streams, Australia Post, Tatts and Mail Delivery. The business is located on the Calder Highway in the Main Street ensuring excellent exposure to the locals and passing traffic. In addition to the local townspeople Wedderburn Post and Tatts has a very substantial surrounding customer catchment area. 15 years established business + $200K Plus Profit per annum + Sustainable competitive advantage + Strong Community demand = A FABULOUS BUSINESS! Shepparton is synonymous with good food, waterways and great weather and is located approximately 181 kilometres north-east of Melbourne. Two terminal Licensed Post Office and store that is well supported by the local community. Australia Post products and services including, passport photos, western union, greeting cards, stationery, fax, soft toys, photocopying, giftware, ice creams, drinks, confectionary, batteries, milk, newspapers, magazines, Coffee and slushy machines. Large retail shop with good storage. The Post commission is around $105k and the business has great potential for growth and to add further lines. Ideally suited for a couple or single operator with part time staff. This modern 3 terminal Licensed Post Office is well located in a vibrant location surrounded by businesses cafes restaurants and major schools. 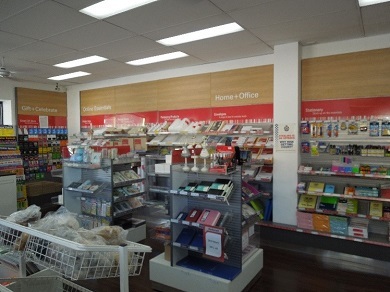 The shop is fitted out to the latest Australia Post Shop fit requirements. The commissions are around $195K. There are 479 boxes. The area is going through significant redevelopment with a growing population. The business is positioned in prime busy location close to the station. Ideal for a couple looking for a business with future growth prospects.